Whether you are cooking for two or prepping a large family meal, the Hamilton Beach® Stack & Snap™ 10 Cup Food Processor takes the guesswork out of food processing with a simple function guide that shows you which blade to use and which button to press. 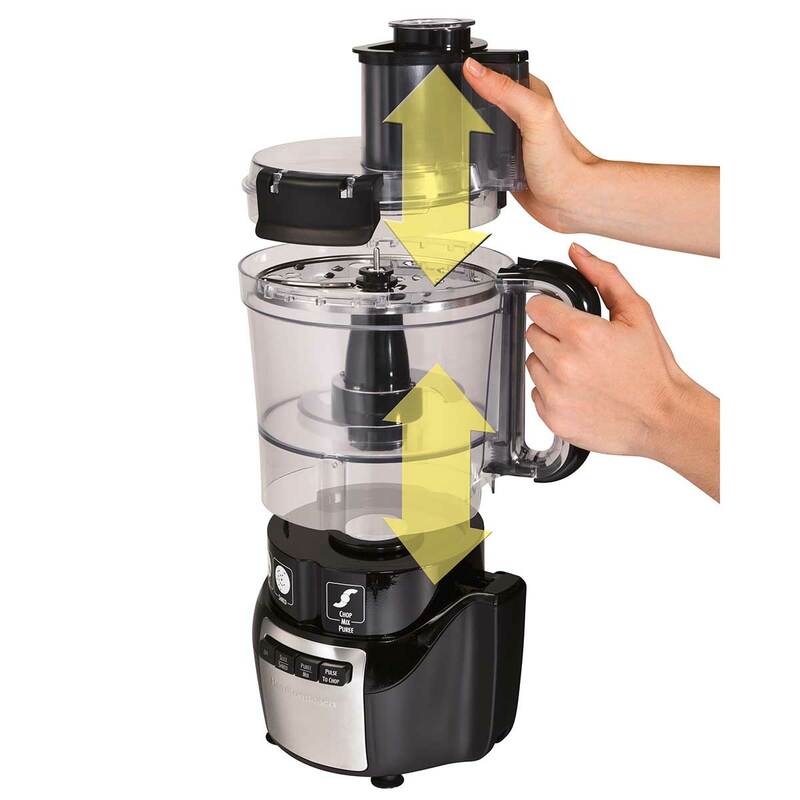 Designed to be uniquely simple – there’s no twisting, turning or locking required when assembling the food processor. 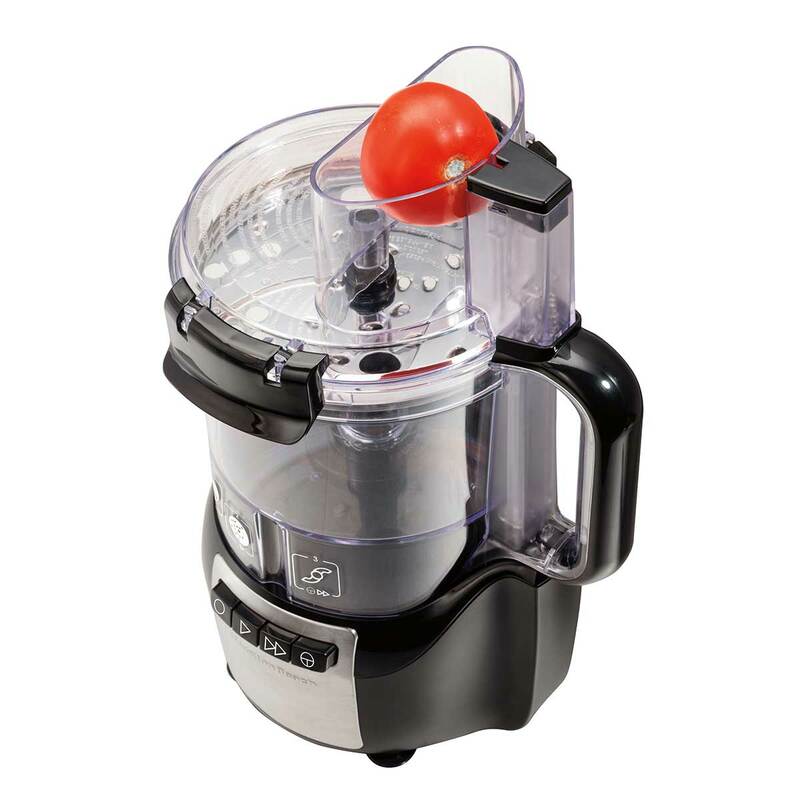 Chop, slice, shred, mix and puree just about anything with the powerful 450 Watt motor. You can process soups, sauces, or other liquids without worrying about leaks because the bowl is sealed. The large-capacity bowl holds 10 cups. This processor has a Big Mouth® feed tube that saves you time by reducing the need for pre-cutting. In-bowl blade storage, cord storage and dishwasher-safe parts make for easy cleaning and storage. Gone are the days of complicated positioning and twisting the bowl and lid into place. With the Hamilton Beach® Stack & Snap™ Food Processor, the bowl is specially designed to fit directly on the base (with no twisting required) and the lid snaps securely to the bowl with simple locking clips for safe operation. No more guessing whether it’s put together correctly, just “stack” and “snap” the parts into place! Mix up a quick pancake batter. Chop onions without the tears. Puree a bowl of nutritious soup. Slice cucumbers evenly for a perfect salad. Chill, then shred or grate your favorite cheese for a variety of dishes. Are you still pre-cutting all your ingredients? If you're doing that, why bother with a food processor at all? The Hamilton Beach® Stack & Snap™ 10 Cup Food Processor accommodates both large and small ingredients, so you can spend less time pre-cutting your ingredients and more time enjoying them. Many food processors come with a maximum liquid fill line, so if you are preparing soup you need to process multiple batches. The sealed bowl holds up to 10 cups of liquid, which reduces the need for multiple batches when processing soups or other liquids. A simple snap secures the lid on to the bowl, with no twisting and locking needed. 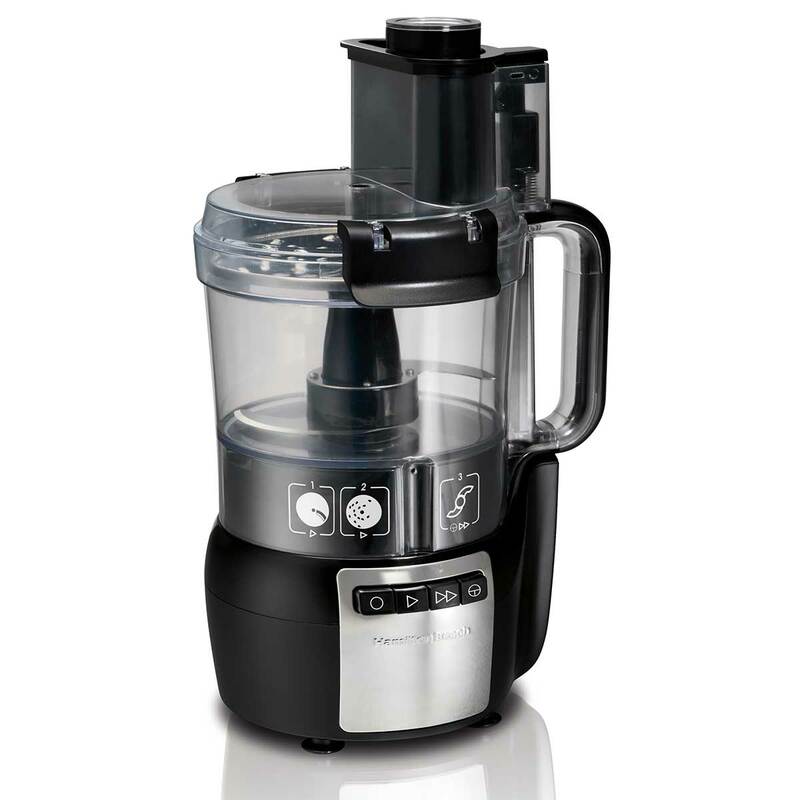 This powerful food processor comes with a 10 cup bowl, which is the ideal size for most of your home cooking needs. 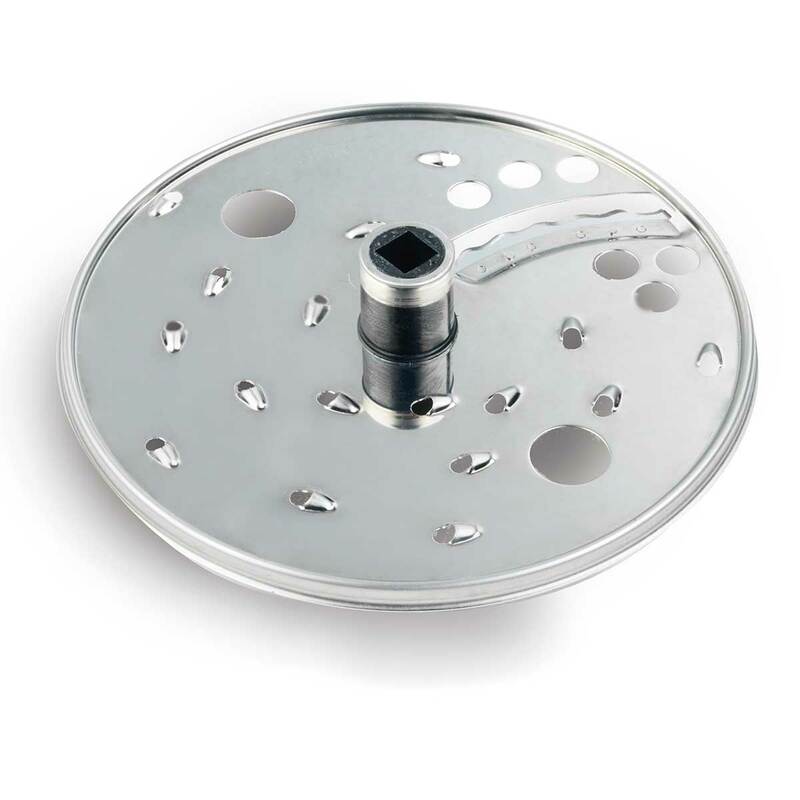 It also includes a reversible slice/shred disc and S-blade for chopping, mixing and pureeing. Cord storage in the back keeps things tidy when not in use. 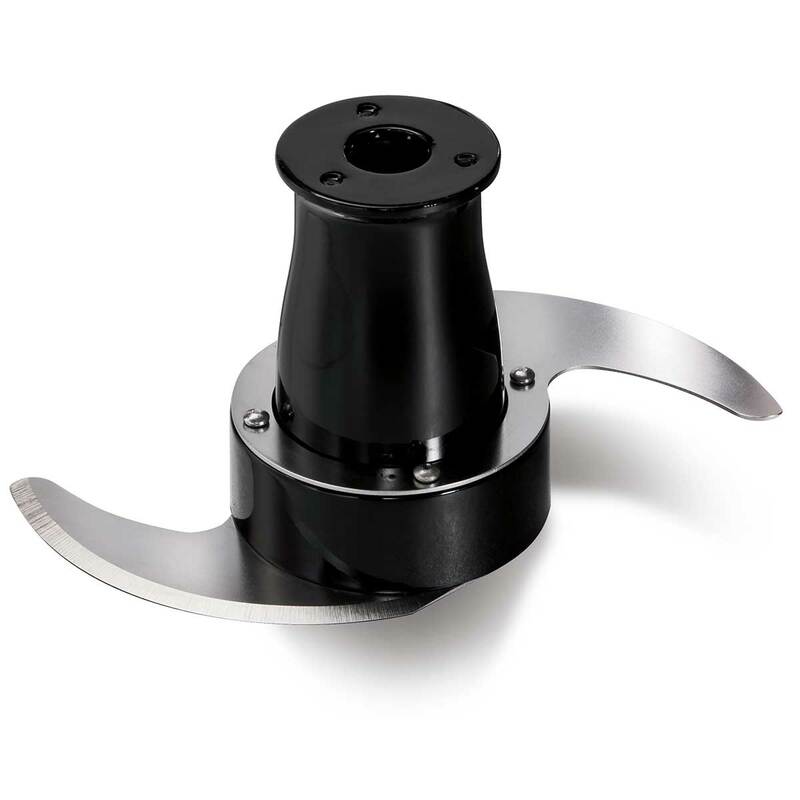 Disc attachments are reversible and labeled, which takes the guesswork out of processing. The label should face up for the desired function. 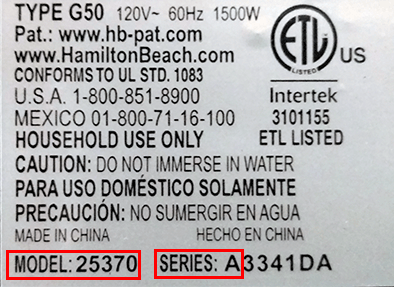 When using disc attachment, do not process foods past the MAX LEVEL indicator on the bowl. Between the S-blade and the reversible slicing/shredding disc, you have many choices available. Use the S-blade for chopping nuts, meat, garlic, onions, peppers, celery, herbs, bread (for crumbs), and crackers. 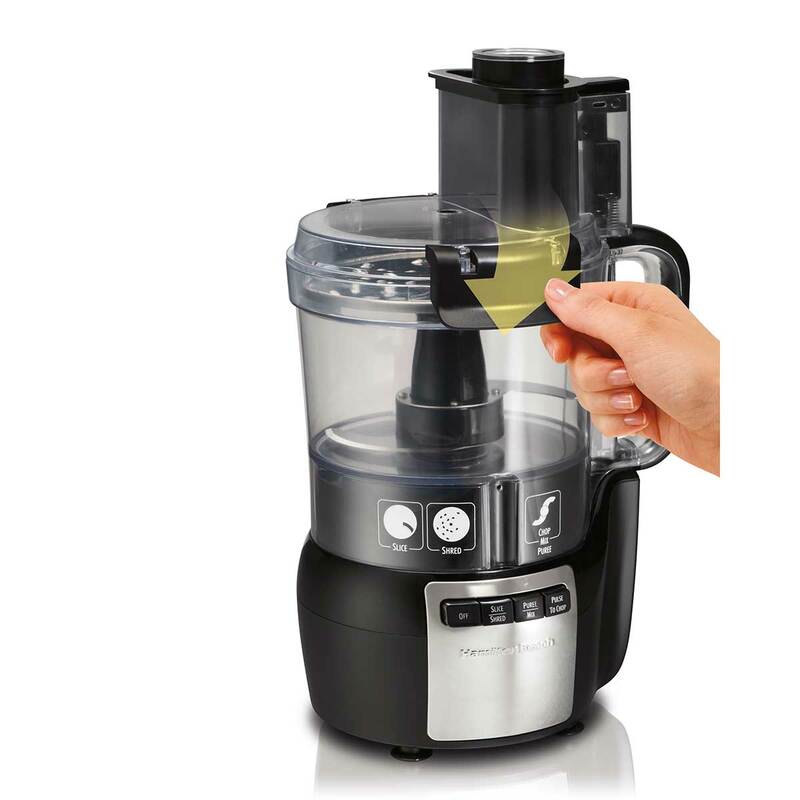 Also, use it to mince/puree vegetables and fruits, mix salad dressings, puree soups or sauces, and to grate cheese. Use the slicing disc (slicing side facing UP) to slice cucumbers, apples, mushrooms, carrots, potatoes, cabbage, tomatoes, pepperoni, peppers, radishes, firm cheeses. Use the shredding disc (shredding side facing UP) to shred cabbage, potatoes, carrots, and cheese. Using the S-blade and with the processor running, drop onion, garlic clove and hot pepper though the food chute and chop until finely minced.